Bucks fever can be seen all over the city. The Bronze Fonz is decked out in Bucks sweatshirt and fans stopped by to take a picture with it in front of the green river. "We are looking to take a run at the NBA Championship, Bucks President Peter Feigin said. "The city is excited about it and this could be fun for us all." Feigin said he worked with Mayor Tom Barrett, the Department of Natural Resources along with Department of Public Works for almost three months to make changing the river color a possibility. "I think you’re going to see more and more excitement as they beat the Pistons...We are looking forward to a championship right here in Milwaukee," Mayor Barrett said. In the crowd of fans, friends Eric and Chad stopped by to see the celebration with their kids. "I've never seen the river turn green before, especially not on purpose so I thought why not give it a shot and bring him down here," Eric Rommelfaenger said. "It’s a little windy and chilly but it’s worth it." Sporting a vintage Bucks Starter jacket, Ron Kurtz said he has been a Bucks fan all his life. He remembers going to games while he was in college, back then tickets were just a $1. Kurtz said to see the excitement around the city is pretty special. "I was around for the 71' championship so that was cool...would like to see a second one," Kurtz said. The river was dyed with an organic vegetable-based substance. According to the DNR, the dye used is the same dye plumbers use to detect leaks. The DNR tested the dye to make sure it was safe for aquatic species and for the public. 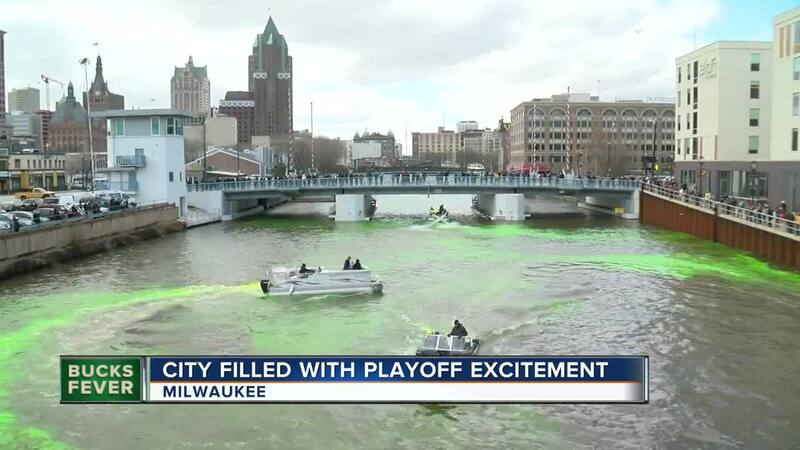 The Bucks organization said dying the river green could be a yearly tradition. Mayor Barrett and Bucks Senior Vice President Alex Lasry unveiled the Bucks branded “Fear the Deer” Hop Streetcar Friday afternoon as well. Inside The Hop there are personal NBA touches. The floor mimics a basketball court and fans can step onto life-size footprints of their favorite players. The streetcar will run through the Bucks entire playoff run.